Something NEW in the Basement! 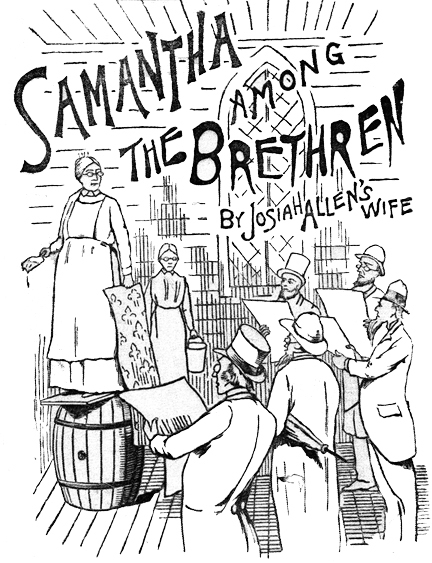 Every Monday we will be serializing the 1892 book 'Samantha Among the Bretheren' by Josiah Allen's Wife (Marietta Holley). Today we begin with Chapter One. This should take until sometime around Christmas for it to be done. In the meantime, our selected authors or themes will still run from Tuesday through Friday. Marietta Holley's writing was immensely popular in the late nineteenth and early twentieth centuries, and she sold over ten million copies of her books. She is almost totally forgotten today, something that we hope to change. George Ade discusses some social engineering in 'The Fable of the Parents Who Tinkered With The Offspring' from 1899.